ABC Community Garden is a place for people to get their hands in the soil and watch things grow. ABC Community Garden is sponsored and hosted by Alliance Bible Church as a non-profit, all volunteer group engaged in growing vegetables or flowers for their own personal use and to share with the community. Our hope is to actively engage youth, families and individuals from the community to develop creative skills in sustainable urban living and organic gardening. These garden plots are available to anyone and are handed out on a first come first served basis. Anyone using a garden plot will be expected to keep the rules of the garden (which will be listed on the community garden contract) as well as volunteer their time to maintain their garden and the shared areas of the community garden. Water and tools will be available to each gardener with the fees for each plot going to cover the cost of supplying these. It is our hope that ABC Community Garden will be a place to plant, harvest and grow together as a community. Please make your check payable to "ABC" and indicate it is for the garden. 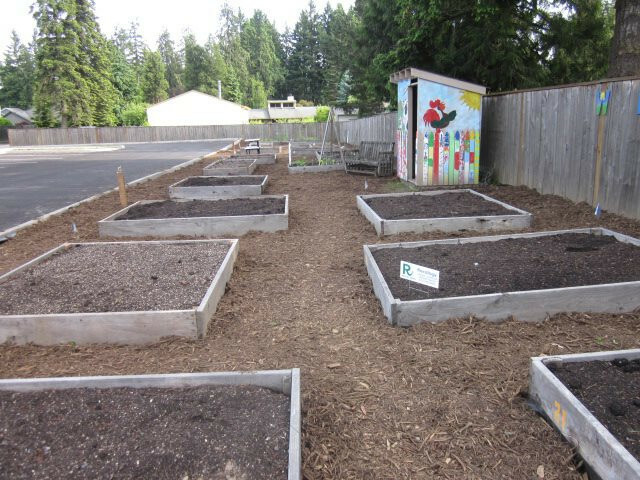 To reserve your plot, print* the garden liability form, sign it, and mail or deliver it to Alliance Bible Church 4174 SE Bentley Street, Hillsboro, Or. 97123 with your check made payable to ABC. A quick trip to the garden and you can pick your own spot on a first come first served basis. Flags are in all the unassigned garden boxes, so if you find the box you like, please remove the flag and write your letter and number on your form. Example A4. Signed forms must accompany payment. All payments are non refundable and must be made no later than June 1, 2013. Once a spot is paid for and all forms turned in you will receive a receipt with your plot number on it. If active gardening has not begun by June 30 your plot will be made available to others and your payment will not be refunded. ABC Community Garden has a non-discrimination policy and the garden plots can be rented to anyone. You do not have to be a member of Alliance Bible Church to rent a plot in the garden. We do not discriminate based on gender, race, color, religion, age, national origin, disability, sexual orientation, and other protected classifications. *Preprinted forms are available in the church office.